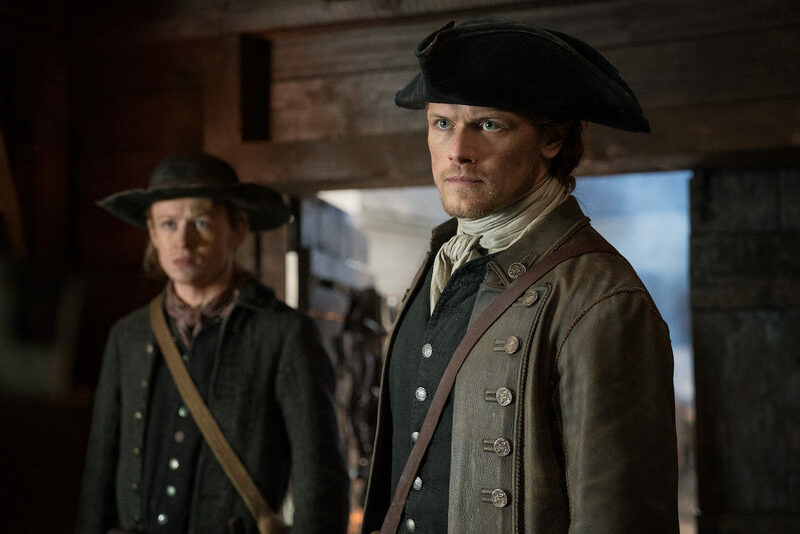 REVIEW: 'Outlander' Season 4, Episode 5 "Savages"
Life on Fraser’s Ridge is moving along, but tensions are rising between the government and the Regulators as well as between the settlers and Native Americans. Here our review of “Savages”! To start “Savages”, we see that Claire and Adawehi are spending more time together. Adawehi is teaching Claire about local herbs and even gives something to help Claire’s future patient after the birth of her child. It’s during this opening scene that Adawehi asks Claire if she has any children. Then Adawehi hands Claire more of the herb that will help the mother and smiles. Adawehi is an incredible healer, and it’s obvious she has the “sight”, too. Inside their cabin later, we find out that Jamie and Claire are going their separate ways for a few days. Jamie and Ian need to go into town and try to recruit men to live on their land, and Claire is going to help a German family nearby whose daughter is about to have her baby. Jamie sneaks one of his mother’s candlesticks without Claire seeing it, and then asks her a very interesting question. In a dream he had the previous night, he saw Brianna and the birthmark she has on her neck. Claire seems shaken with the memory, and it’s so odd for Jamie to have a vision on his daughter, but here we are, and Adawehi just said that she was “here”, so…what’s going on with Bree? From this moment, “Savages” follows three separate storylines. In Woolam’s Creek, Jamie and Ian are recruiting Scottish farmers to help settle Fraser’s Ridge. The offer Jamie’s making is incredible, too. 100 acres and no rent until the land yields its first good harvest. Then they’ll only pay “no more ha’penny per acre per annum, in lieu of all demands” to Jamie. This offer sounds great to me, but the men around the table don’t accept his offer. When he approaches one of them at the bar, he finds out why. This man served time in Tilbury Fort and was at the Battle of Culloden. He wants to help Jamie, but Governor Tryon’s tax collectors have already run most of these men off their farms to begin with. They collect taxes then collect again, lining their own pockets. Jamie tries to appeal to him by saying that he’ll only have to pay a fair tax, but none of them are willing to risk it. Jamie’s invited to a meeting that night with the Regulators, but it doesn’t appear like he’s going to attend. As he and Ian load up their wagon, the bit on the harness breaks, and Jamie send Ian to get it fixed at the smithy. He tells Ian to pay whatever he must because they need to get back home. Ian does at Jamie says, and tries to bargain with the blacksmith, who ends up asking for twenty-one shillings to fix the piece. When he turns around, we see that the blacksmith is Murtagh, and even though Ian doesn’t know it, the audience does, and from this point forward, the episode took me on an emotional rollercoaster. Murtagh is alive and well and MY HEART IS HEALED! During this interaction, Jamie tries to make an attempt to visit the silversmith in town, but only his wife is there. This is the second time he’s tried to meet the man and only seen his thirsty wife, and honestly, I can’t blame this woman. If Jamie showed up on my doorstep, I may have to question myself, too. Still, Jamie can’t get something made from the candlestick for Claire, so he leaves. He meets Ian who shyly tells him that he spent all of Jamie’s purse on getting the bit fixed to which Jamie loses his patience and goes to confront the smithy. We see Murtagh’s face when Jamie comes in yelling about twenty-one shillings, and in that instant, you know he recognizes Jamie’s voice. When he turns around at they see each other for the first time in years, Jamie’s eyes fill up with tears. They hug and Jamie introduces Ian as Jenny’s boy. It’s such a beautiful reunion. At the tavern, we find out that Murtagh was an indentured servant in the colonies for twelve years before he was granted his freedom. It was a difficult time for him, but now he’s established a business. He’s doing well. Since he’s a good blacksmith, Jamie asks Murtagh if he does any silversmithing as well. That’s when Ian tells Murtagh that Jamie’s trying to have something special made for his wife. Jamie hands over the candlestick, and Murtagh sees the initials at on the bottom. 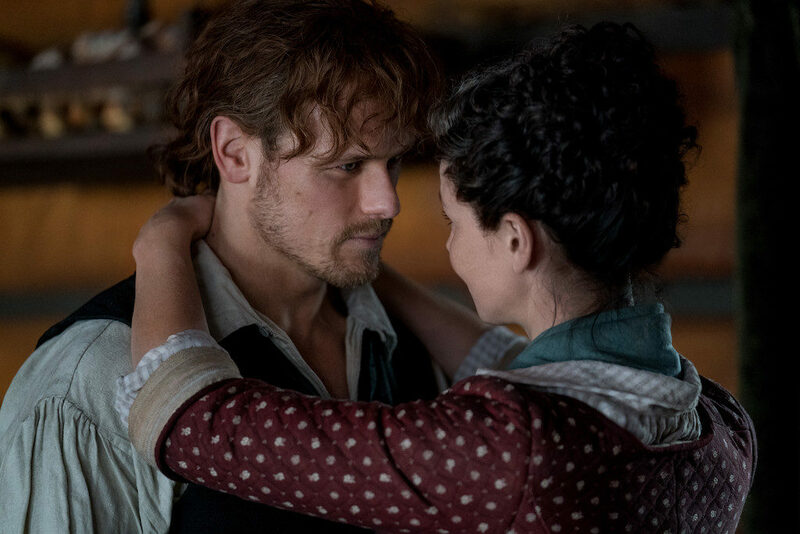 Murtagh always had a love for Jamie’s mother, and this seems bittersweet for him. He also seems take aback about news of Jamie’s wife and that Jamie would marry again. 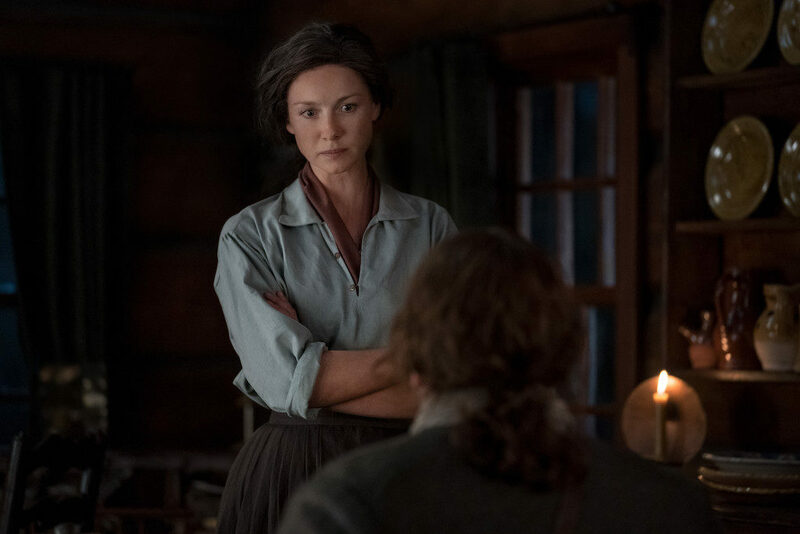 Jamie sends Ian away and tells Murtagh about Claire returning. My smile was way too big throughout this entire scene, but then things get serious. 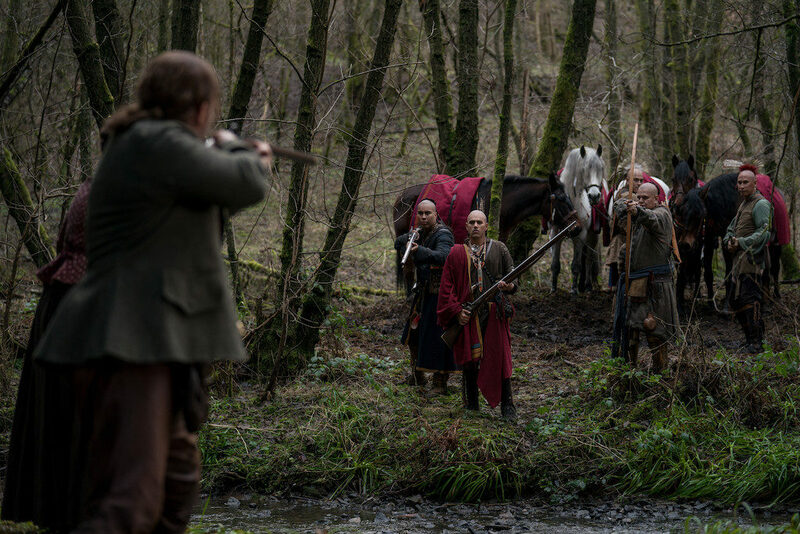 Since he has found his friend again, Jamie offers Murtagh some of the land he was given by Governor Tryon. Murtagh isn’t keen on this man at all. He reiterates what Jamie knew before, Tryon’s taxes are forcing most of these Scottish farmers into giving up farming. He doesn’t want to leave his forge in town, and he’s got business to attend to. He asks Jamie to attend a meeting with him later that night, and of course, Jamie doesn’t turn down his friend. At the meeting, we find out that Murtagh is the leader of the Regulators! Honestly, this is so on brand for Murtagh. He’s not going to stand by why the British take something else from them. Jamie, on the other hand, is really getting stressed that no matter which way he turns, he’s going to end up in another war. After the meeting, Murtagh approaches Jamie and asks if he’ll join them, but Jamie does what the men did to him earlier…tells Murtagh that he can’t. They leave the meeting and Murtagh looks saddened but understanding about Jamie’s decision. At the Mueller home, Claire helps Petronella deliver a healthy baby girl, and it’s such a sweet family moment that Claire gets to be a part of. Herr Mueller returns with his son to meet his new granddaughter, and the whole family is thankful to Claire helping Petronella through the birth. So much so that they name the baby after Claire, Klara. The reunion doesn’t stay happy for long due to a few Cherokee letting their horses drink from a creek in front of the Mueller’s home. The father takes out of his rifle and his son has a pistol pointed at the Native Americans, telling them to get off their land, and Claire intervenes when the Cherokee raise their own weapons. Before they leave, Towadi sprinkles something into the creek water, and Herr Mueller raises his weapon again, saying that he’s cursing the water. Claire tries to explain it’s a blessing over the water, but the Mueller won’t hear it. Soon, after Claire leaves to go back home. Two more days pass, and we see Claire’s routine. Feed the animals, knitting, sitting back with a glass of stout whiskey, cooking with Rollo at her feet. A week passes, and the local priest rides up to Fraser’s Ridge to tell her that Herr Mueller has gone insane with grief. Petronella, baby Klara, and his son are all dead from the measles. Mueller believes the Native Americans cursed the water, and the Priest is afraid he’s going to come for Claire to kill her since she didn’t let him kill the Cherokee to begin with. For the next two days, Claire waits for him to show up, and when he finally does, his actions are devastating. He doesn’t hold Claire responsible and hasn’t come here to kill her at all. She tries to explain to him that measles pass from person to person quickly, and Petronella and the baby didn’t stand a chance since they were so weak. In what Claire sees as a gesture of good will, Mueller hands over the cloth that had been used to carry the doll for his granddaughter. Claire believes it to be the doll until she opens it, and sees its the scalp of Adawehi. Claire is shocked and tells him that this woman was their healer, but Mueller calls her a witch. She was foretelling her own death, and the deaths of the Mueller family. Still, this is a horrific action against a peaceful, incredible woman. The Cherokee won’t allow this to stand, and Claire orders Mueller out of her home. That night, Mueller returns to his own only to find that the Cherokee are burning it down. His wife is dead on the lawn, and soon, he has two arrows in his back, too. Jamie finally returns the next day, and Claire runs to him. She doesn’t explain at first, only asks that he hold her. A little time passes, and Claire is outside, completing her daily tasks when she hears someone whistling a song not of this time. She turns and sees Murtagh walking toward her, and she runs to hug him. It’s an absolutely bittersweet reunion, but I’m so happy that he made his way out to Fraser’s Ridge to see them. Roger arrives at Inverness and starts tracking down Bree. He finds out that the taxi she rented only took her to Craigh na Dun. The man who runs the taxi service suggests that maybe she was waiting for someone out there, and that’s why she didn’t come back. Y’all there’s no telling how many people have just disappeared through those stones and these people were like, they left with someone else. It’s what they did with Claire, too. After that talk, Roger goes to the inn that Bree had been staying in to talk to the owner. He asks the woman if she remembers anything about Bree or if Bree left anything at all. The woman looks at him with such pity but tells him no. Obviously, a nice Scottish girl would fix all this. After he’s by himself, Roger reads the letter Bree left him, and we see Bree for the first time (days before). She walks up to the stones and the camera pans around right as she touches them. When we get the front of the stones again, Bree is gone. If you’re reading this, it means that I couldn’t make it back. I found out something terrible is going to happen to my mother and Jamie. If I didn’t try to go and help them I would never have forgiven myself. I need you to know that I cared about you very much. Please don’t follow me, Roger. You told me to think of my mother happily in the past and that’s how I want you to think of me. We see Roger again, and it’s obvious what his next move will be. He’s going to go after Brianna. What did you think about “Savages”? Are you ready to see where Bree ended up? Will Roger follow her? Oh, and Murtagh is back so we can all celebrate!! Catch our WSN Reviews series on YouTube and be sure to live tweet with us each Sunday at 8/7c!